This weekend Sept 17-18 my friendly neighborhood Harley/Ducati dealer has test rides. I suffer from knees that do not like a bent leg position for any length of time. So anything less than 90 degrees won't cut it for me. The cruiser position works well for me but I would like to try something a bit different. With that bit of background I am wondering if anyone can suggest a non cruiser that might suit my limitations and that I should try to test ride. My inseam is 33 inches (83cm) I am about 5' 10" (178cm) though shrinking fast. I used to be about 6'3" (190cm). You have two or three choices that have any kind of legroom in the Ducati line. The Superbikes, Monsters, and Streetfighters don't offer a lot of legroom. The Multistrada and Hypermotard have pretty good legroom. I'm not sure about the Diavel, because I've never seen one of those. If you're coming off of a 750 Shadow, the first choice should be the Hypermotard 796. It's a fun bike. The Multistrada, with its 1200cc engine is a very fast and powerful bike. It also does everything quite well and I would love to have one, if they didn't cost so much. Since they're giving test rides, sign up for whatever you're most interested in first, then ride whatever else you can for the experience. I'm pretty sure that they won't have a route available that is appropriate for a Superbike and it probably won't work well for showing off what any of the Ducatis are good at. But you'll get an idea of what the seating position is like and the power, even if you won't be able to tell much about the handling. If the guy in charge of the test rides is the same one that comes out to the west coast, expect a speech about how sensitive the brakes are compared to whatever you're riding, and how they expect you to behave on the ride (no wheelies, hard acceleration, etc.). For those rides, I like to either be at the very front or the very back so that I'm not affected as much by inexperienced riders. Usually you're stuck in whatever position the bike is parked in. I have something else going on Sept 17, or I would be at the local BMW, Ducati, Triumph dealer for the BMW demo truck. That's the one European brand that I haven't done a demo truck ride on. I've tried a few BMWs, but only on dealer demo bikes. Demo rides have helped me change my mind about a few brands, in particular KTM, which I bought specifically because I was so impressed by it during a demo ride. I was hoping you would reply Scott. I appreciate the suggestions and hope that one or more will be available. Don't know what route they have in mind but here is a link to what I would have planned. Hope the link works. "B" in the map is the Harley dealership and "A" is just a point that shows where we would begin to double back. Shore road ranges from 25 - 35 mph curves. There would be 2 roundabouts in the route, only one traffic light once you get to the park and some straight stretches. I would say that the route I have outlined can be travelled in 20 minutes, longer if they want to stop at the Orchard Beach parking lot which is very, very big for some PLP. It is in the map but not shown. Look for the words Pelham Bay in the water and the parking lot is encompassed by the road to the left. The route outlined is pretty much my pre-ride warm-up which includes some PLP before I head out. It is about 10 minutes from home. Streets to slab to parkway to roundabout to PLP to second roundabout to shore road to suburban streets to parkway north with no particular destination in mind. Not too shabby. I don't think they'll do the double loop around that one roundabout. I've also only been on one demo ride where they ever stopped longer than it takes to get through a stop sign. On that one they allowed a few of us to switch bikes, which I appreciated. I didn't get my first choice initially, but was able to trade for it at the half-way point. It turned out that the one I was on first impressed me much more than the one I thought I was most interested in. Have fun on the demo ride(s). Yesterday I was not able to stop off for the demo ride. I got called in to work. Today I headed up for the demo ride. The day is perfect. The bottom line is that I did not get to ride. The one bike I wanted to ride was booked. There weren't all that many riders but the few that were there wanted to ride the Multistrada. There were 8 bikes, 6 Harleys and 2 Ducatis available. Only 7 demoed on each ride since the group leader would ride the 8th. Had I driven there I would have put this "Monster" in my trunk. It would take up no room at all in the garage. This Multistrada was the one I wanted to ride but the earliest slot available was just shy of 4pm and I did not want to wait around that long. I found out that most of the riders had signed up for it. They were riding the other bikes just to kill time waiting their turn. I did get to sit on the Multistrada and found that I could flat foot it comfortably. Getting my leg over the rear was interesting, even in my younger days I did not believe in kicking that high. The shifter and foot brake are about the size of a couple of cuff links I have. The leg position was not good but definitely not bad. I can see where I might get comfortable with it. Now to look up the specs and the price. It is a 1200 but should I sell it I can say garage kept, never saw rain, and never been above second gear. The VStrom would be a first choice but this one could be a close second. Guess I will have to find some way to ride them both. I have so many questions that would be answered in a 15 minute ride. Sorry about the picture sizes. I tried to trim them down. I hope they automatically resize. 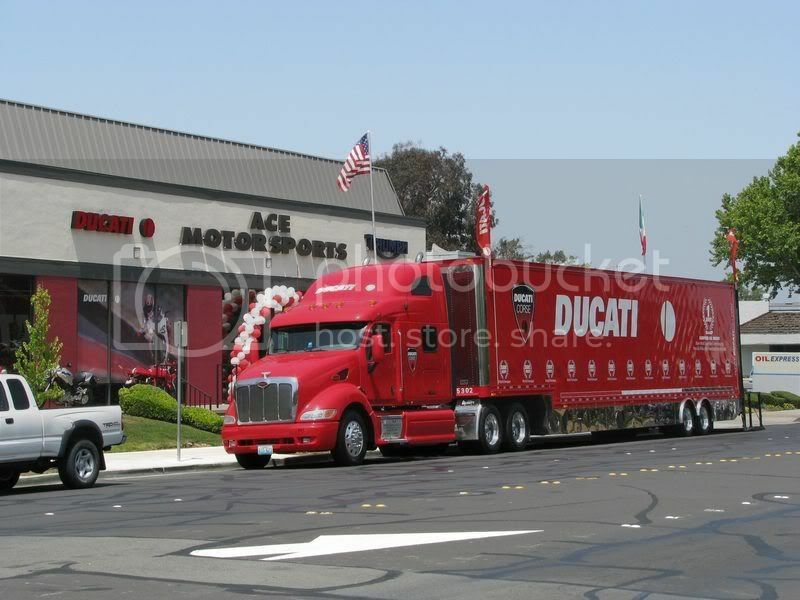 With just two Ducatis available, clearly it wasn't the Ducati Truck with the bikes, because they bring about a dozen. That usually means that it was one of the dealer's demo bikes. You should be able to stop in at another time and get a demo ride on one of those. Some dealers will let you just take a bike out for 20 minutes. I've done that at the Harley dealer in Livermore, at the BMW/KTM/Triumph dealer also in Livermore (on all three brands), at Arlen Ness Victory, plus out at Modesto Ducati. Other dealers will let you take a test ride, but they will insist on someone from the shop leading you. If you seriously want to try out the Multistrada, you should drop in at the dealer again and see if you can talk them into letting you ride it. You might end up with a better test ride than what you would have had on one of their group rides. I love the red and green paint on that Monster. Thanks for the heads up about it probably being a dealer demo bike. There was definitely no truck in sight and the parking lot before you get to their parking lot is huge so it would have been parked there. I'll ride up there first chance I get and ask. I appreciate the offer. I will use it as a jumping off point for members to critique my thinking. Some years back I loaned a friend a sports car for a couple of weeks while his was car was in for repairs. On the drive home from picking up his car he totalled it. He rolled his car over on a turn that he had done just about every day in the sports car. The sports car had never even notice it was there. He walked away unhurt but it stayed with me through the years. I enjoy my current bike too much to want to replace it. That means I would be bouncing back and forth between 2 rides. I need to know how much difference there would be between the 2. We talk about muscle memory that we want to develop by plenty of practice. I don't want confused muscle memory to kick in at the wrong time. At this point (and maybe overconfidence is kicking in) I am not concerned by the potential speed of any bike since it will not go any faster than I want it to. While none of these can really be nailed in a short ride I view the short ride as I would the use of my mirrors. They can tell me don't go although they can never tell me go. For example I apply back brake on my current bike with my toe nails (tip of the boot). If peg position on the new bike is going to force me to use the ball of my foot that might be a deal breaker. I really think that's a recipe to not like any other bike than your current ride. Going from a laid back, low, feet forward bike, to a tall, sit up, high CG, powerful, Brembo twin disc... it's going to be different, in every point on your list. I think every time you might buy, or demo, or swap bikes, you have to get acclimated just like riding for the first time. Even those that own several bikes often get aquainted a bit when switching out to the other bike. Going from a cruiser to an adventure bike is probably as an extreme difference as you'll likely find. One other thing in my experience is that I have adjusted the footpegs, foot and hand levers, handlebars, suspension settings, headlight adjustment, hand grips etc, on every bike I have owned to suit my liking as well. They don't necessarily come brand new from the dealer set up perfectly for YOU. Brakes, throttle, clutch, steering input, is always something YOU acclimate to on a new bike. I started an answer to this once, then decided not to. Let me try again. I've had a few bikes that were quite a bit different from each other and been able to successfully switch between them. Probably the most extreme example would be the Ducati 888 Superbike and the Honda XR650L (or maybe a Ducati Monster and Yamaha YZ-250). As with any new bike, it takes me a while to get used to it fully. I figure that I need about 1000 miles to completely adjust, even though I usually feel quite comfortable on a new bike within the first 100-200 miles. But it takes me a thousand miles to get to the point where I know what to expect from it in all situations. If I haven't been on a bike for a few hours, I'm able to hop on whichever one I choose and adjust to the ergonomics right away. However, If I get off of one and immediately get on a different one, it takes me a mile or two to get to the right comfort level on the motorcycle. For example, if I switched from the Ducati ST2 to the Ducati 888, besides the different riding position, the throttle was much stiffer on the ST2 than the 888, the brakes were more touchy on the 888, and the ST2 had more torque at low engine speeds, so it didn't have to be revved as much when pulling away from a stop. That meant that I had to think about it while leaving my neighborhood, for example, if I had just switched bikes. Switching from a Ducati to an XR650L meant a huge difference in power, a big difference in brake feel, and a very different riding position. Now, with the KTM and Honda, the riding position is similar while the big difference is power and weight. I have to be careful when going from the XR to the KTM because the KTM is a bit taller and weighs 150-200 pounds more. It's easy to forget the difference and get off balance with the heavier bike. Shifting is also quite different, since I think the KTM will go faster in second gear than the XR will in fifth. The bottom line here is that once I've put in my thousand miles on my latest motorcycle, it doesn't take long for me to adjust to it. But if I hop off of one and onto the other, it still takes a few minutes to switch over completely. I'm pretty sure that it would be the same - for me at least - switching to any other motorcycle. The several demo rides I have done this year, in my seemingly endless search for the "perfect new bike" for me mirrored your experience in quickly switching from one bike to another. The various demo events were all very well attended and there was a significant wait to get a ride time on the specific models I wanted to ride. I got to each event on my bike but had anywhere from an hour and a half to two hours before my demo ride time. I had very little issue getting on the demo bikes and feeling comfortable enough that I felt I could safely ride them and evaluate the machines. The "differentness" was expected and was easily adapted too, albeit with a healthy dose of extra attention to everything. I think you need to go into a demo ride with the assumption that no matter how different or similar the bike is to your regular ride, that almost EVERYTHING will be and feel different in some way. It is up to you to try to discern if it is a good different or a bad different. LOL. Different is EXACTLY what I am looking for but I need to experience the difference. One other thing in my experience is that I have adjusted the footpegs, foot and hand levers, handlebars, suspension settings, headlight adjustment, hand grips etc, on every bike I have owned to suit my liking as well. I know people who buy bikes then change the seat, buy risers, change the bars, change the shocks, change the chain, change the number of teeth, switch wheels etc. Me I'll buy the bike next to it that already has that stuff. BTW, that group IMO has the best of both worlds. They obviously enjoy building something different (makeover) and they enjoy riding. I envy them but that is not me at this point. I'm pretty sure that it would be the same - for me at least - switching to any other motorcycle. I have no concern with switching rides. I will adapt to the new ride (based on past history not on bikes but on other vehicles). I obviously did a poor job of expressing my concern. We talk about muscle memory and practicing things such as threshold braking until it becomes automatic. We say that when you change your ride you revert back to newbie status because of the difference in handling, braking etc. To get back up to speed requires miles of PLP and road riding. How many miles depends upon the rider and to a lesser degree the difference in rides. My assumption is that you are retuning muscle memory for that new bike. The question that comes to my mind and that only I can answer for me is what would happen if Honda VT750DC muscle memory fueled by adrenaline is applied to a Hayabusa when a cage left turns in front of me? Would I swerve myself off a cliff or endo myself into being the meat in a metal sandwich or would I accelerate the bike out from under me and leave myself laying in front of the moving car. Yeah, I can be melodramatic. In anything I do I try to anticipate and nullify any problems that might come up. Thus my need for a short ride to check out the new brakes, the sensitivity to bar input, and the amount of acceleration caused by twisting the wrist. The rest is to see how much effort to fine tune the bike to my needs. All of those would be considerations for me though probably not for most. Oops, forgot to thank you guys for helping me test my thinking. My replies are meant to explain my thought process. Thanks for helping me think things through. I am listening and thinking about your comments. Please consider this a discussion (which may get lively) and not a debate. I am especially interested on everyone's thoughts about developing muscle memory when you have two very different rides. I wasn't talking about buying a single new part, except grips. Adjusting what comes on the bike to fit yourself is what I am talking about. And you were quite clear about it. I have the bad habit (I am trying to do better) of taking a quote and using it as a jumping off point for a related but different thought. I "know" your point of view on adjusting from prior posts. I have found them to be very helpful to me. My response was poorly framed. Sorry. It was not my intent to make your response seem to be something it was not but in effect that is what I did. Mea culpa. I have looked at the Multstrada prices and yelled ouch. The 2012 models range from a low of 15k to over 24k for what appears to be the same bike. Plan B has lead me to see what used prices look like. The 1200 (please correct me) seems to be relatively new with it's predecessors being the 1000, and 1100. Does anyone know if it is essentially the same bike with different engine sizes or are there significant differences? The first Multistrada was a totally different bike from the current one. Originally it had a two-valve air-cooled 1000cc V-twin. They later bumped it up to 1100cc's. The new Multistrada 1200 is a four-valve water-cooled superbike engine with a different cam that gets better low-end power and does better with fuel mileage. The rest of the bike is totally new as well. Other than the name and the idea that it works well on "any road", they're different bikes.